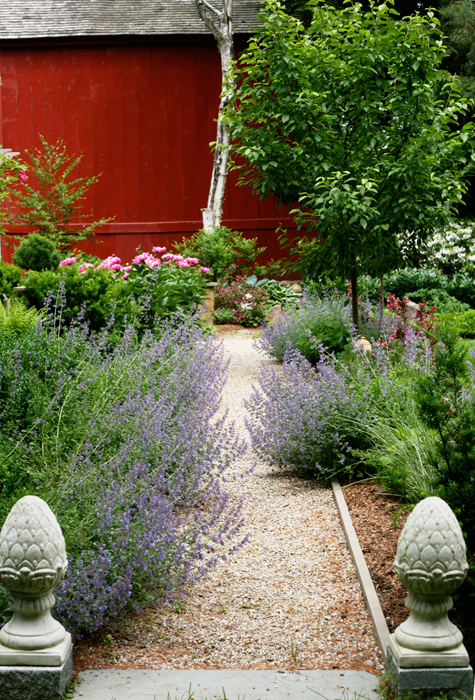 The gardens at Juniper Hill Farm surround an 18th century saltbox house and farmstead that remain much as they were 200 years ago. The approximately 2 acres of gardens surrounding the farm might best be described as "country formal," although there was never any overarching scheme that drove the direction of design. The truth is, I have always included design elements that please me, regardless of whether they have a strong association with a certain style, as long as I feel that they can be reinterpreted to fit the place. 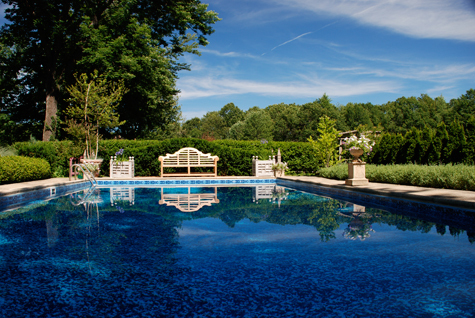 There is a courtyard garden reminiscent of the "mas" farmhouse properties of Provence that was designed by Gordon Hayward, a formal lilac garden, a boxwood parterre leading into a woodland garden, a whimsical wildflower meadow, a tranquil Mediterranean inspired "clipped green" garden, a formal potager, and a pool house that might best be described as a New England version of the garden pavilion at Hidcote. Scattered throughout the garden are over 150 boxwoods representing eleven different varieties. The boxwoods are a favorite and I am continually trying to test the limits of hardiness in new varieties as they appear. Because winters are very long here in New Hampshire, winter interest was an important consideration in the layout of the garden and thus strong architectural lines are evident throughout. We began the gardens in about 2004 and the various areas have evolved slowly over time. All of the gardens are relatively immature and we are, without a doubt, at our tipping point in terms of still being able to maintain them without a team of manor house gardeners. 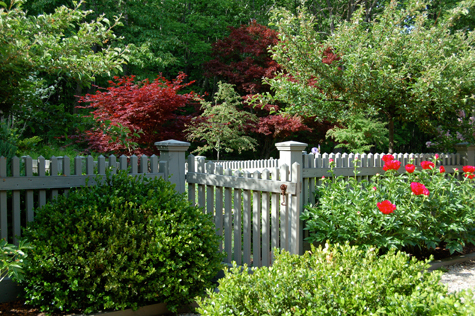 The gardens are often open for selected garden tour dates and through the Garden Conservancy's Open Days Program. They have also been featured in several regional and national magazines, including Monadnock Living and Organic Gardening.